Brazilian director Jose Padilha imaginatively captures the essence of Robocop’s moral dilemma in the 21st century reboot of the popular 1987 cult hit Robocop, by blending a human story with that of greedy industrialists, partisan politics and a dash of media saturated parody. 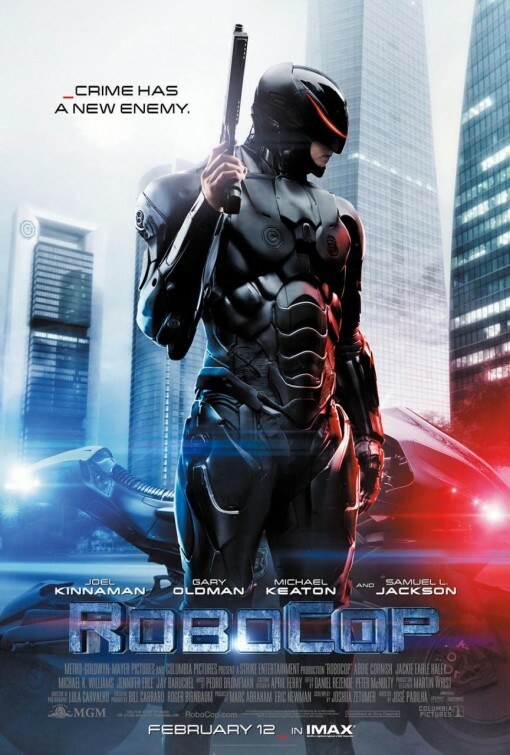 Joel Kinnaman takes on the part of Detroit police Detective Alex Murphy who is blown apart in a car bomb and who is reassembled with the assistance of the sinister Omnicorp robotics corporation, a role that made actor Peter Weller famous in Dutch director Paul Verhoeven’s original film. Whilst Kinnaman’s Robocop does not require much acting beyond a couple of confused facial expressions, it’s really the supporting cast of Padilha’s version which do the film justice. Abbie Cornish is oddly cast as the confused yet betrayed wife Clara Murphy, Michael Keaton is brilliant as the greedy industrialist Raymond Sellars who wants to unleash part man part machine cyborgs onto the crime ridden streets of Detroit and then there is Gary Oldman as sympathetic Dr Dennett Norton who reconstructs the almost obliterated Detective Murphy into Robocop who has become more machine than human with the exception of a brain full of fluctuating dopamine levels. What elevates Robocop from another popcorn sci-fi film are the superb special effects, the crisp editing and Padilha’s emphasis on media parody brilliantly done in the scenes with Samuel L. Jackson (Pulp Fiction) as the no nonsense TV presenter who frames the narrative in a series of audacious TV interviews in the ultra sophisticated show The Novak Element – a spoof of Piers Morgan Live and Sky News. Pro-robots TV presenter Pat Novak is wonderful as a mechanism for blending parody and pastiche in a dystopian society where Omnicorp robots will eventually replace the existing police force of all American cities. For as Robocop opens The Novak Element goes live to the streets of Tehran where robots are policing the local Iranian population but are not allowed onto American soil due to a political decision known as the Dreyfuss Act, banning robots on American streets. What Robocop is incisively commenting on is America’s controversial use of drones in foreign battlegrounds like Libya, Afghanistan and Pakistan. Michael Kenneth Williams plays Murphy’s partner on the corrupt Detroit police force and assists Robocop in tracking down the real criminals behind his attempted assassination. Like the original film, 2014’s Robocop is set in Detroit the home of motor manufacturing but in recent years also one of the only American cities to file for bankruptcy after the 2008 recession due to corruption, maladministration and urban decay. Yet in this version, Detroit looks like a city on the mend especially with the establishment of the Omnicorp headquarters, which become Robocop’s ultimate nemesis. As with Mary Shelley’s Frankenstein where the mad scientist creates a monster who in turn, attacks his creator, there is this thematic twist of an illusion of control. In Robocop, the recreated ruthless part man/part machine turns on the company which created him, especially Sellars who only sees the hybrid cyborg as a money making product to be marketed by Omnicorp to other American cities in the proposed interests of crime prevention despite the ethical protests of Dr Norton, a rather softened Gary Oldman (The Fifth Element). Jackie Earle Haley (Little Children) plays Omnicorps muscle Rick Mattox who is eager to test Robocop’s combat abilities in a simulated combat environment. Other stars include Jennifer Ehle (Contagion) Jay Baruchel as Omnicorp relentless marketing man and Marianne Jean-Baptiste (Secret and Lies) as Police Chief Karen Dean helping rounding off a solid cast to compliment the purposefully wooden Kinnaman. What makes the 21st century Robocop so stylish, is Padilha’s slick direction from the aerial shots of a Detroit skyline to the mind blowing special effects to the crime reconstruction sequence by Robocop/Alex Murphy in his suburban driveway. Robocop along with some brilliant action sequences, a cool slate grey body armour suit, becomes an antihero and the films chillingly predictive narrative arc is punctuated by some human conflict in terms of his family and loads of media hype with the parody infused TV show The Novak Element. As a film, Robocop is an entertaining, provocative and enjoyable sci-fi thriller which points to an impressive and marketable finished product, much like its anti-hero.